Welcome to Above and Beyond in Pigeon Forge! 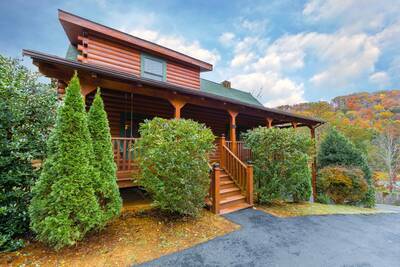 This super convenient, easy access Smoky Mountain cabin is the perfect place to enjoy your next vacation! 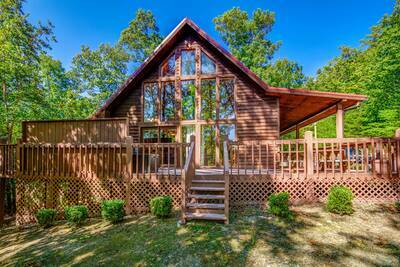 This beautiful 2 bedroom, 2 bath cabin rental sleeps up to 8 guests comfortably. 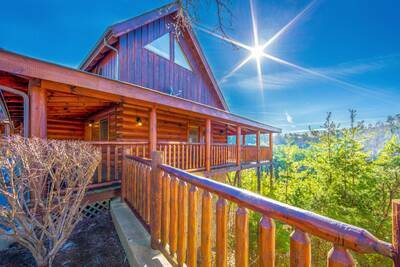 You’re sure to love the bright, gleaming, floor to ceiling wood interior of Above and Beyond. It’s exactly what you’d expect in a luxurious Smoky Mountain cabin rental. The main level features an open living, kitchen and dining area with abundant windows that seem to bring the outdoors in. The tall cathedral ceiling only enhances the room, providing more room and sense of space. The main level also features a cozy Queen bedroom, full bath and an adorable bunk bed closet that is perfect for the little ones joining you on vacation! Upstairs is a truly impressive master suite. The bedroom boasts a King size log bed, angled wood ceilings and an on-suite bath with a jetted tub. If you’re in need of some quality rest and relaxation, then this is the place to experience it! Outside you will find a wonderful covered wrap around deck. A great place to enjoy your morning coffee or to spend a lazy, relaxing evening reading your favorite book. Also on the deck is a warm, bubbling hot tub for splashing around in or massaging your worries and cares away. Above and Beyond is located minutes from the Pigeon Forge Parkway, giving you quick, easy access to shopping, dining and attractions with no steep mountains to navigate. 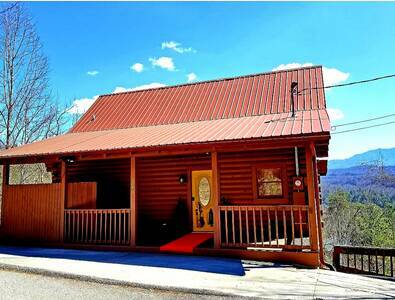 You and your special guests are sure to enjoy all of the amenities and convenience offered at this beautiful Smoky Mountain vacation cabin getaway. Call today to plan your adventure in Above and Beyond! A: It is not available in this area at this time. A: Hi Jerry, the cabin is equipped with 1 King, 1 Queen and 2 sets of Twin bunk beds. A: Above and Beyond does not allow pets at this time. A: Hi Shannon! Yes, Above and Beyond is located in beautiful Wears Valley. A: Hi Leticia! It is a wooded view with views of the surrounding ridge tops. 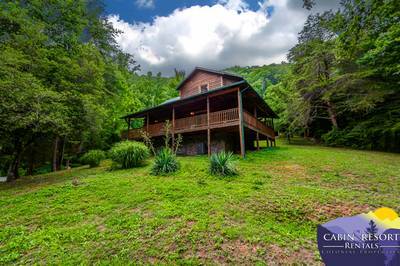 “ The cabin was very nice and in a quiet location. “ Excellent experience. Everything was perfect and clean as shown on the web. My kids and I had a great vacation. Highly recommended. “ This was my first visit. It was more than i hoped for.. The staff at Check in was wonderful the view was great and the cabin location to everything was perfect.. Thank you and i will be back!!!! “ Our experience was excellent! From booking and reservations to the clean, comfortable cabin in the woods, it was an wonderful experience!! The staff was courteous and friendly! Excellent place to stay! 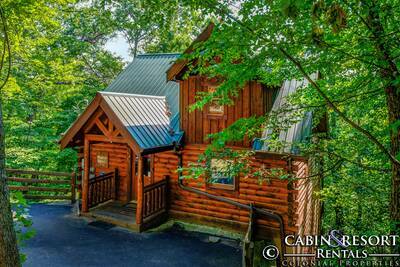 “ Above and Beyond is a lovely well maintained cabin. The kitchen is very roomy with plenty of storage. Both bedrooms have ample closet space and both bathrooms are very large. The porch is spacious as well. We found the cabin to be very cozy and comfortable and felt right at home in it. We would rent it again. “ While I grew up in the area, it was my wife's first trip. So much better than a hotel, clean, easily accessible and of course, everything about the property is gorgeous. This will be our new residence away from Texas! “ A Phenomenal stay !!! A Great escape from daily life !!! A comfortable stay quite roomy !!! It was nice to be one with nature . Centerly located ??? “ This was our first time to stay in this cabin. Everything was just like it showed when viewing online. It is in a great location. 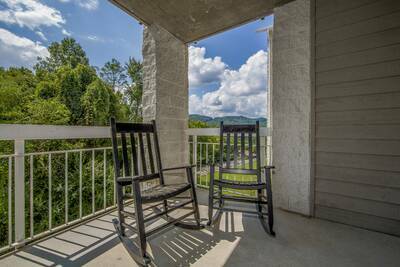 Not to far from Pigeon Forge, but just far enough out to get away from the hustle and bustle. I highly recommend this cabin to anyone. My family and I had a great time and plan on staying again when we get the change to come back. “ It was everything I expected and more! I love the outing and the veiw was amazing. I would most definitely be coming back. Thanks for a wonderful getaway.